Tollers are since 2001 part of our family. We, Paul and Mariette Wentink , have lived since 2001 together with our three children in Ermelo, a village situated close to heathland, woods and the Veluwemeer. After the move we found we had room for a family dog. 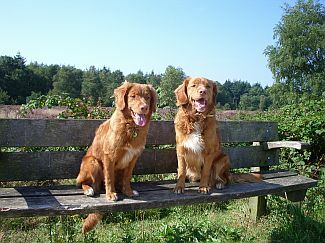 After thorough research and comparison we chose a Nova Scotia Duck Toller Retriever, in short Toller. We did not have any preference for a male or female dog; there were no plans to start breeding with the dog yet. After some time we were informed that the v.d. stam de Duffelt kennels had a litter of Toller-puppies. One of these, a female , would be available for us. Gisée was born on the 24th of October 2001 and moved in with us in December of that year. September 2004 we registered with the Raad van Beheer ( Kennelclub) under the name: v. Telgter Spreng. Mariette has since acquired the certificate Dog-breeding Knowledge 1 and is studying for certificate 2. We always raise the puppies in our family and sell them only with a pedigree. We spend a lot of time socialising the dogs.